The whole procedures will be managed by delegated tailor. It is included the creation from sketching style, measuring, fitting, alteration and completion of the garment. Cutting your clothes is performed individually by hand from the fabric you select, using the paper pattern that your personal tailor has developed from your body measurements and your unique figure. All the details are followed strictly, all patterns and stripes match properly at all seams. Our clothes are truly hand-tailored by definition. We put machine-stitch only on the portions of the clothes for which machine-stitching will have a better result, such as the pants seams, the sides and back seams of the jackets, etc. Even with this, over 75% of your clothes is still made by hand. Of those portions that need machine stitching, we still use the hands-on approach, as we have to hand press the pieces to ensure that it come to the shape we want. Before we use the sewing machine, the pieces of fabric were joined together carefully, hand basted to ensure perfect smoothness before we put them together by machine. Taking measurements and reading your figure is the first step in making your clothes. There are 21 measurements and 11 checking points (with 40 varieties) of your posture to be taken and recorded in the first fitting. Just thinking about this kind of detail begins to explain why a custom suit fits and moves in a way that cannot be bought off-the-peg. While we are constructing your clothes, the pieces are steam-heat shrunk, actually before cutting. This step allows the fabric to go back to its original form, since it has suffered so long by being twisted and kept on a bolt. For jacket, the canvas has to be shrunk by hot water. That is one of the reasons why one jacket still survives after numerous dry-cleanings when the other doesn't. In order to maintain highest possible quality of workmanship, every item of our work is cut and tailored in our own workshops. Most of the work is even made on the premises. Although we can make almost any apparel, we are better in woven fabrics clothing then knitted apparels. 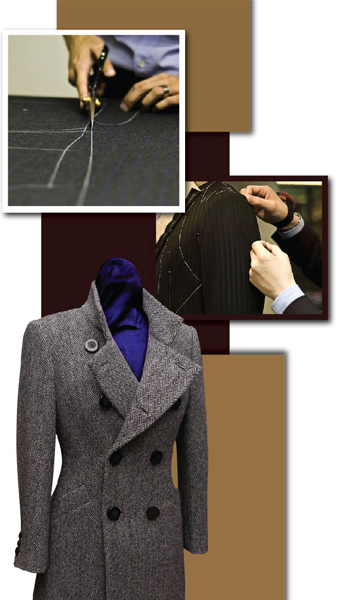 We specialized in tailoring coats, suit, jackets, shirts, skirt, blouse, dress and evening dress.